The shoulder joint consists of the clavicle, scapula and humerus (upper arm bone). Due to the nature of the joint there is a huge range of movement or shoulder joint actions available. The muscles of the shoulder joint are the subscapularis, latissimus dorsi, infraspinatus, teres minor, teres major, supraspinatus, deltoid, and pectoralis major (pec muscles). 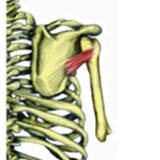 The subscapularis muscle is one of the four rotator cuff muscles. It is hidden behind the rib cage on the underside of the scapula or shoulder blade and is often injured by throwing sports. Origin: Entire under surface of the scapula (subscapular fossea). Insertion: Less tubercle of the humerus. Actions: Internal rotation, Adduction, Extension and stabilization of the glenohumeral joint. Innervation: Upper and lower subscapular nerve. Example strengthening exercises: similar to those of the latissimus dorsi and teres major, including pull downs, rope climbs. Stretching: Externally rotate the shoulder and raise the arm up at the side (abduct). Origin – Posterior crest of the ilium (via the Thoracolumbar fascia). Insertion – Intertubercular groove (between the greater and lesser tuberosities) of the humerus. Daily uses – Pushing on the arms of a chair when standing up. Example strengthening exercises – Lat pull down using a resistance band. Example stretches – Latissimus dorsi stretch I. 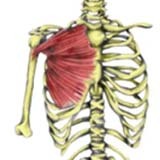 The Infraspinatus muscle is one of the four rotator cuff muscles crossing the shoulder joint and is commonly injured. It is the main external rotator of the shoulder joint. Origin – Posterior surface of the scapula (below the spine of the scapula). Actions – Shoulder horizontal abduction. Daily uses – Brushing hair. Example strengthening exercises – Lateral raise. Example stretches – Internal rotation stretch. Teres Minor is one of the four rotator cuff muscles surrounding the shoulder. 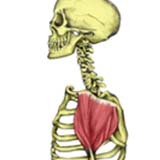 Its main action, along with Infraspinatus is to externally rotate the shoulder joint. There are two Teres muscles, the other being Teres Major. 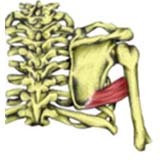 Origin : Mid section of the lateral border of the scapula. Insertion : Greater tuberosity on the humerus. Daily uses : Brushing hair. Example strengthening exercises : Shoulder external rotation. Example stretches : Internal rotation stretch. Related injuries : Rotator cuff injuries. Related muscles : Supraspinatus, Infraspinatus, Subscapularis, Teres major. 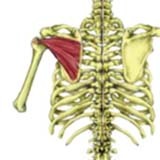 Teres major is only functional when the Rhomboids fix the scapula. 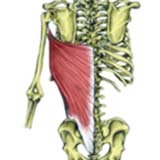 This muscle mainly helps Latissimus dorsi. 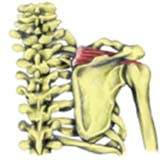 Origin : Lower 1/3 of the lateral border of the scapula. Insertion : Intertubercular goove (between the greater and lesser tubercles) of the humerus. Innervation : Lower subscapular nerve. Daily uses : Tucking the back of your shirt into your trousers. Example strengthening exercises : Shoulder internal rotation. Example stretches : External rotation stretch. The Supraspinatus muscle is one of the four muscles which make up the rotator cuff. Its main function is to stabilise the upper arm by holding the head of the humerus in position. It is important in throwing motions to control any forward motion of the head of humerus. Insertion : Greater tuberosity of the humerus. Daily uses : Holding shopping bags away from the body. Example strengthening exercises : Lateral raise. Example stretches : Supraspinatus stretch. 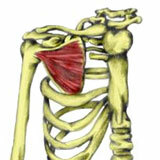 The deltoid muscle is used in all side lifting movements and any movement of the humerus on the scapula. It is divided into three portions, anterior, middle, and posterior, with the fibres having different roles due to their orientation. Pectoralis major is the largest and most superficial of the two chest muscles. Pec major and the anterior fibres of Deltoid work closely together. Pec-fly and push-up exercises work the Pectoralis major. Origin : Medial 1/2 of the clavicle. Costal cartilages of the first 6 ribs. Insertion : Intertubercular groove (between the greater and lesser tubercles) of the humerus. Innervation : Lateral and medial pectoral nerves. Daily uses : Using roll-on deodorant. Example strengthening exercises : Pec fly using a resistance band. Chest Press using a resistance band. Example stretches : Chest stretch. Chest stretch with a partner.